So, you’ve got auto insurance for your car, health insurance for your health, flood insurance for your property, and home insurance for your house. Everything’s covered! Yay! Whoa there. Not quite. These days, it seems like you’ve got to insure everything if you want it covered in case of loss. There’s pet insurance. Celebrities are insuring their body parts. And, while you probably don’t need to insure those killer legs, you probably want to check to make sure you have some sort of personal property insurance (or personal belongings insurance). Despite what you may think, your home insurance doesn’t necessarily cover your personal properties. They might have some small rider that will pay out a small amount to replace certain essentials like clothes and such, but if you’re ever in need of it, you’ll quickly find that it will fall far short of replacing much of the personal property that you owned. Some of the things will have caps on them for value. Got a killer gaming computer? Not covered to it’s full value. Many people are choosing to add a personal property policy to their list of insurance policies. Part of getting a personal property policy is being able to identify the item, it’s value, and prove both. Here are three ways you can use to record the property that you own, and do it easily. Spreadsheet — Create a spreadsheet for each room and list the items you are insuring from that room. Be sure to record any serial numbers and model numbers that you can. A short description can also be helpful. Take Pictures — Combined with a simple spreadsheet, take pictures of the items that you own in each room. This can help identify the items, and act as proof of serial and model numbers as well as condition. Contents Video — Take a camcorder (or any device that records decent quality video) and walk through each room of your house, recording each item that you’ll be insuring. Again, be sure to record serial numbers and model numbers. You can use the ability to record voice to add in descriptions as you go. Properly recording and keeping track of your property can make purchasing your personal property insurance a much easier task and make sure that you’re insured for the proper amounts and items so that you don’t find yourself trying to replace expensive items that you though your home insurance would cover. There are many ways to make sure you are getting the best price possible when you are shopping around for homeowner’s insurance. By taking these steps, you can be sure you are getting a low rate and quality protection for your home. When looking for a new homeowner’s policy, ask around. Find out where your family and friends obtained policies and ask for recommendations. You can also do Internet searches or inquire at a few different insurance offices to compare quotes. Make sure that when you compare rates, you are looking at policies that are similar to one another. You can save money on your monthly premium by choosing a plan with a higher deductible. This can take the pressure off your pocketbook when it comes to paying your monthly bill. Of course, you’ll want to make sure that you can afford the higher deductible in the unlikely event of a catastrophe. You can possibly save between 5 to 15 percent if you buy your other insurance policies from the same company. Ask your insurance agent how much you could save if you purchased another type of insurance such as auto, life, or health in addition to your homeowner’s policy. You don’t want to be paying for coverage that isn’t necessary. 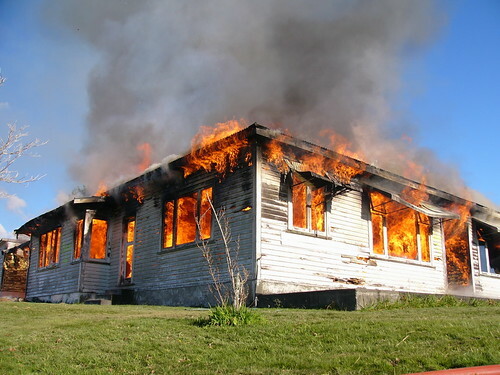 Make sure you are insuring your home for what it would cost if you needed to rebuild it. The land is already there and immune to most disasters–if something happened, only the home itself would need to be covered. Many insurance companies will offer lower rates if they know you do your best to protect your home. Make sure to have working smoke and fire alarms and sturdy locks on your windows and doors. Insurance companies also like to insure homes that have strong roofs, storm windows, indoor and outdoor sprinkler systems, and other structural improvements. It also doesn’t hurt to consider putting in a home security system to lower your home owner’s insurance rate. More often, insurance companies are taking a closer look at credit scores to determine rates. Always try to pay your bills on time and try to keep your credit balances low. Every year you should review your credit report to make sure that everything is accurate. If you are a person over 55 and you are retired, you may qualify for a discount. This varies with different insurance companies and isn’t always the case, but it doesn’t hurt to ask. Also, check to see if you can save money by paying your yearly premium upfront versus paying it in monthly installments. You can sometimes save between 5 to 10 percent by paying your premium all at once. Saving money on home insurance can be easy if you take the time to shop around, ask questions, and do your best to be a responsible home owner. You’ll be happy you took the time to find the right policy when you see the extra money in your bank account.